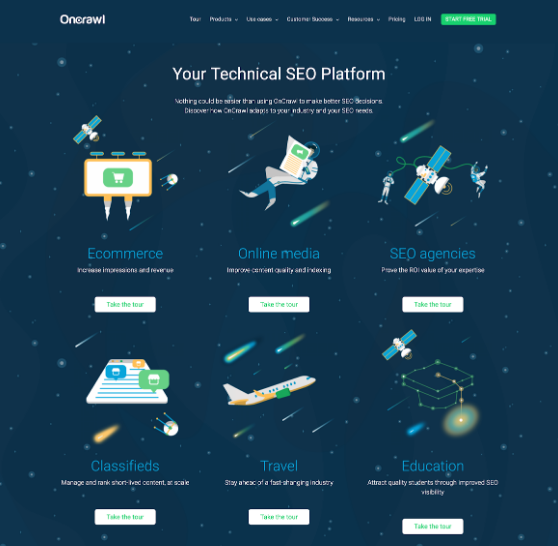 April 2, 2019 – The award-winning technical SEO platform OnCrawl releases its new brand identity and reinforces its position as an innovative actor in the SEO industry. Technical SEO is at the heart of OnCrawl’s DNA. The solution has been developed by Big Data pioneers and search engine experts who began working in distributed software and web scale algorithms in the early 2000s. With performance, scalability and reliability in mind, they implemented their own web scale SEO crawler with natural language understanding and user behaviour modelization. They have invested significant effort to merge data science and search engine optimization and to offer cutting-edge features that tackle real SEO issues. Recognized by 800+ clients – such as L’Oréal, Future, Major League Baseball or Ticketmaster – a place in finale at The 2019 Marketing Technology Awards and with two European Search Awards to their credit, the rising company needed to rebrand their identity to reflect their philosophy, to mark their rapid growth and also become quickly distinguishable in the not-so-small landscape of martech providers. The space universe and the associated metaphors quickly came to mind. “OnCrawl is like a data control center and our crawler is a spaceship exploring different planets and universes,” shares François Goube, CEO and founder at OnCrawl. Moreover, they already had started to use this lexical field through their baseline “Unleash your SEO potential”, their “Rocket Program” training and visual branding for some of their goodies. At the same time, space exploration evokes their core brand values: Innovation, Excellence, Authenticity, Kindness, Competence and Ambition. The parallel between scalability – OnCrawl’s ability to crawl both small websites as well as millions of pages and treat billions of log lines – and the capability to navigate with the OnCrawl spaceship from planet to planet is easy. The OnCrawl’s team also defines itself as a bunch of astronauts connecting different worlds (sources of data that can be integrated in OnCrawl’s solution) and building their very own data platform. OnCrawl’s crew speaks different languages and interacts with different species (their different types of customer and level of expertise) and, while OnCrawl is the most advanced technical SEO platform, they are always on a mission to make their technologies available to others, no matter what their background or skill level. OnCrawl’s new branding comes along with a new website as well as a strong new social identity, completely reworked by their design team. They have refined their personas to match customer expectations and deliver the best on-site experience by offering a tour segmented by industry. A panel of 17 strategic use cases have also been added to introduce how OnCrawl can support their entire search engine optimization process with real and reliable data. The Star Author program is also part of this rebranding. OnCrawl’s editorial team works with a constellation of technical SEO writers to enhance their expertise on the blog and foster a long-term relationship with top technical SEO professionals. OnCrawl is a technical SEO platform for enterprise SEO audits and daily monitoring. The solution helps e-commerce websites, SEO agencies and online publishers to improve their organic traffic, rankings, and revenues by opening Google’s blackbox. Driven by a strong tech spirit, OnCrawl gives search marketers easy access to the data they need by providing actionable dashboards and reports to support the entire search engine optimization process. The company has already closed two successful fundraising campaigns to become the leading SaaS provider for search engine optimization. With offices in Bordeaux, Paris and Montreal, OnCrawl currently works with over 800 clients in 66 countries and has won two years in a row the Best SEO Tool award at the European Search Awards.